This effective and gentle process removes the unwanted dead skin cells that have built up layer after layer. In addition, Baby Foot can improve other foot issues like: Foot Odor, Athletes Foot and Blood Circulation. So say goodbye to rough, dry, cracked soles, by using a product that really works! Packages available for men and women both. Also Baby Foot Moisutizing Foot Mask Avialagle. $25 for product to treat yourself or a friend. $35 for in-house treatment which includes a lavender foot bath, foot massage and cup of tea. Bring a friend or two. 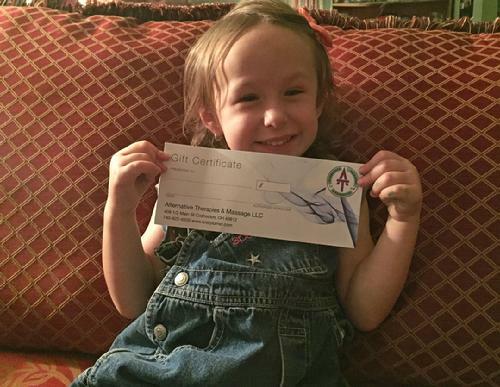 Our Gift Certificates make great presents! 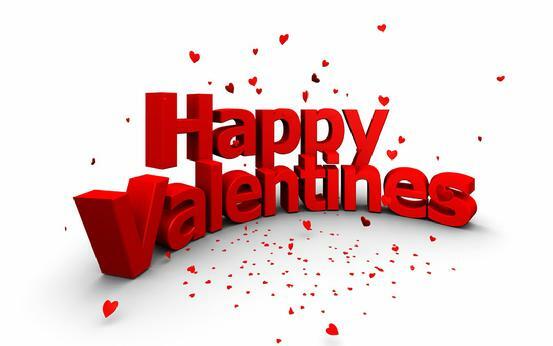 Make their Valentine wishes come true this year with a gift certificate from Alternative Therapies and Massage. Now you can buy them at Dean's Jewelry or online. All major credit cards and PayPal accepted. 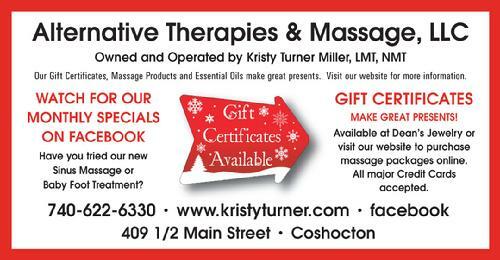 Make their holiday wishes come true this year with a gift certificate from Alternative Therapies and Massage. Now you can buy them here or at Dean's Jewelry. All major credit cards and PayPal accepted. 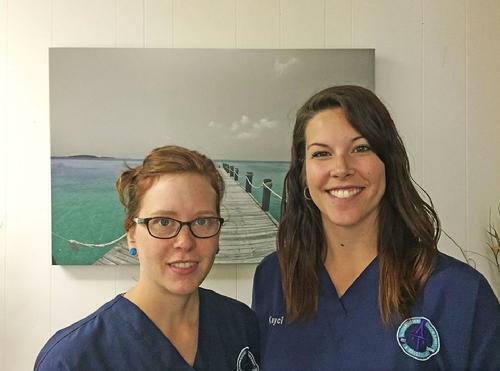 Have you scheduled an appointment with Heather or Kayci for a Sinus massage? They can relieve your allergies, sinus headaches and sinus pressure. Our Sinus massage uses a variety of acupressure techniques, cooling bulbs and R.C. (Respiratory and Chest) Therapeutic grade essential oil. We massage your scalp, face, and shoulders. Call today! BUSY MOMS AND DADS WITH KIDS need a foot and lower leg massage. Improves circulation and reduces pain. 1/2 hour @ $40. Joy is our Essential oil of the Month. HAVE YOU TRIED JUICE PLUS+? What is Baby Foot? An innovative foot care product that will make your feet as smooth and soft as a baby's foot. The unique formula of 17 types of natural extracts allow your feet to exfoliate naturally leaving them highly moisturized. Heather starts with a soothing scalp and face massage. She will wash your face with a Young Living essential oil face wash to gently clean your skin. Then she will apply a cooling Young Living Face masque for twenty minutes while you get your choice of a hand or foot massage. After removing the masque she will finish with Young Living Toner and Renewal Serum. All Young Living products are designed to soothe your skin leaving it feel more radiant. The exotic blend of orchid petals and essential oils helps refresh stressed areas and promote a more youthful appearance. It is suitable for all skin types. Reg. $69. 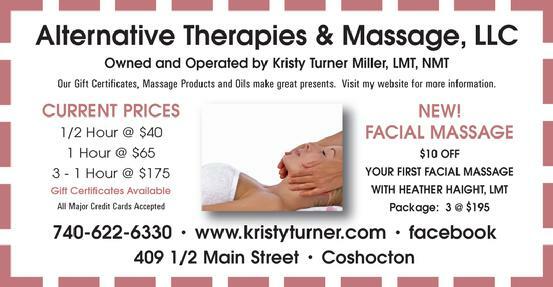 Now $10 Off your first Facial Massage with this special offer. Package: 3 @ $195. 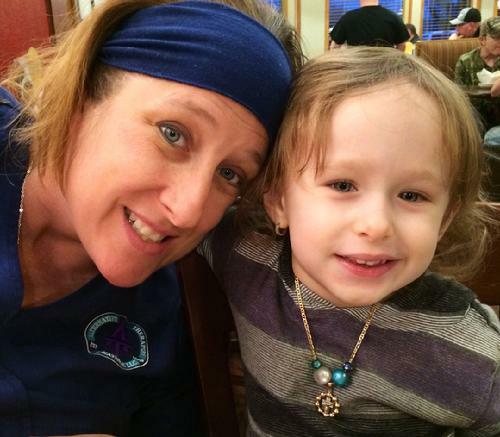 Please join us in welcoming Heather Haight to Alternative Therapies & Massage. 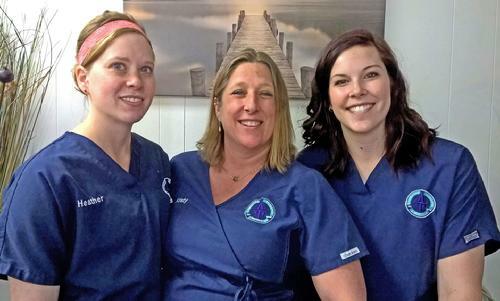 Heather graduated from River View in 2006 and went on to study massage therapy and receive her LMT certification from Knox County Career Center in Mount Vernon. 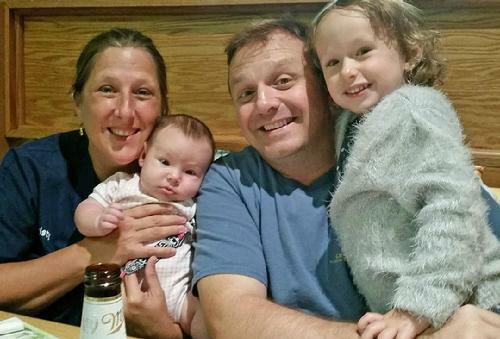 You may have seen her around town working as the Assistant Manager at the Coshocton Federal Credit Union or having a fun night out at the Coshocton Bowling Center. Heather is available for appointments on Monday, Thursday and Friday at 5:00 and 6:30. And on Saturday at 10:00, 11:30, 1:30 and 3:00. She will add more hours in a few months. 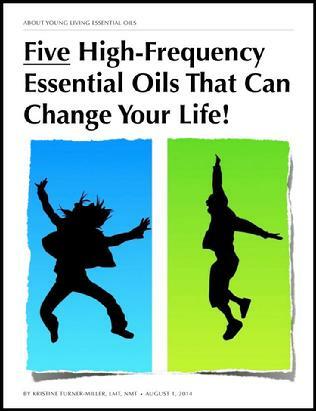 All of the "Five High-Frequency Essential Oils That Can Change Your Life!" are on display in my office and are available at their suggested Retail Prices. Also, please note that quantity discounts and Wholesale Prices are available online. Use this link to enroll in the Young Living distributor program and to order Young Living products at Wholesale Prices. 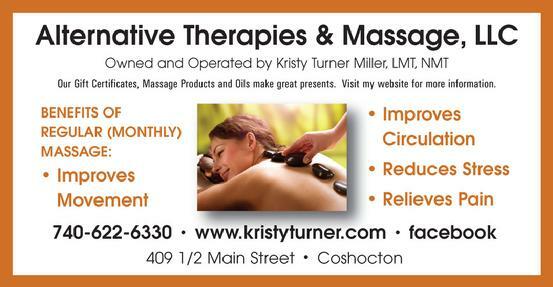 Alternative Therapies and Massage, LLC is located between Dean's Jewelry and the Coshocton County Chamber of Commerce. 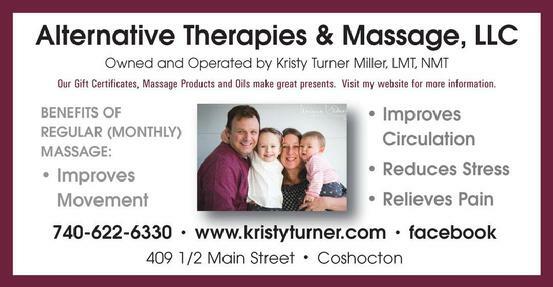 The owner is Kristy Turner Miller, who learned the art of massage therapy and earned her degree as a Licensed Massage Therapist at the American Institute of Alternative Medicine in Columbus, Ohio. According to Kristy, massage is "pretty amazing". It keeps the body functioning the way the body should function, which is especially important with the constant changing stressful lifestyle that we all face today. Humans are made to adapt to pain. By working the muscles through massage, you are feeding the muscles and bones, working waste out of cells, and increasing blood and lymph flow so that the body is working and moving as it should. 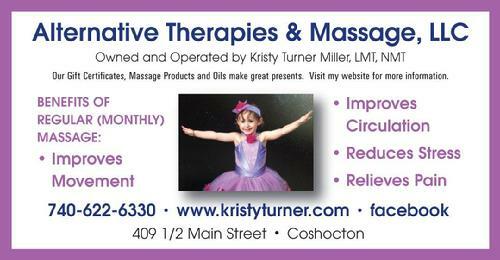 Kristy enjoys helping people function better, both physically and mentally. That is why she pursued a career in alternative therapies and massage, and why she excels at what she does. Kristy offers a variety of massage, geared to her clients preference and needs. She believes communication is essential and varies pressure according to her clients request. 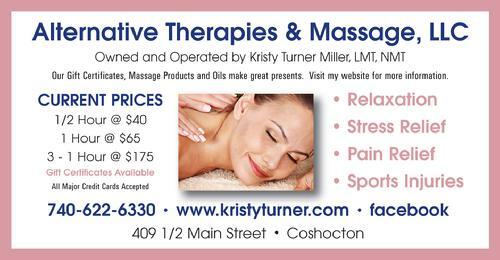 Individual massage is offered from 30 Minutes for $40, 60 Minutes for $65, 90 Minutes for $95, or 120 Minutes for $125 . Packages of 3 (60 Minute) massages are available for $175. 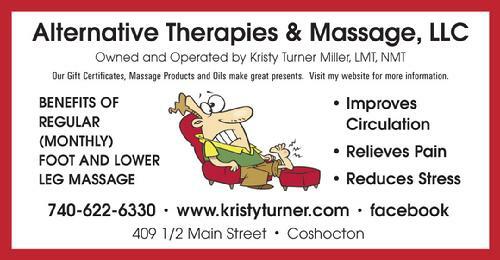 Kristy can also perform swedish (relaxation) massage for stress relief and therapeutic deep tissue massage for stiffness and pain relief. Kristy is trained to perform the Reiki system of natural healing and offers a sixty minute treatment for $65. Reiki was founded by Dr. Mikao Usui in the early 1900's. It is a Japanese technique for stress reduction and relaxation that also promotes healing. It is administered by "laying on hands" and is based on the idea that an unseen "life force energy" flows through us and is what causes us to be alive. If one's "life force energy" is low, then we are more likely to get sick or feel stress, and if it is high, we are more capable of being happy and healthy. A treatment feels like a wonderful glowing radiance that flows through and around you. Reiki treats the whole person including body, emotions, mind and spirit creating many beneficial effects that include relaxation and feelings of peace, security and wellbeing. Many have reported miraculous results. Kristy also offers aromatherapy using Young Living Essential Oils ®. This process is available for $10 wherein she adds a scented therapeutic oil to your massage lotion, then the extra lotion blended with oil is yours to take home. Kristy also blends her own oil spritzers, bath salts, roll-ons and lotions, which are all priced individually. For $65 Kristy offers peppermint foot and leg treatment which is wonderful for tired achy feet and legs. She is proficient in reflexology which uses hand, thumb and finger techniques applied to the clients hands and feet. 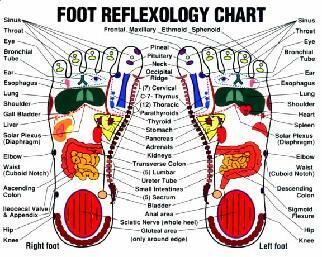 Reflexology treatment is available at a rate of $40 for thirty minutes. Kristy can be reached at her office on Monday, Wednesday, Thursday, Friday and Saturday. Call for an appointment and enjoy the benefits of massage today! Sombra's Original Warm Therapy Pain Relieving Gel has become one of the leading topical analgesics in the market today. Great for chronic conditions and basic aches and pains, the gel has a refreshing orange-citrus scent to it. Relieves minor aches and pains of muscles and joints associated with arthritis, simple backaches, strains, bruises and sprains. Absorbs quickly with a refreshing orange scent. Unique warming and cooling ingredients. Why Use the Thumbby™ Soft Massage Cone? The Thumbby™ feels like a thumb. The Thumbby™ saves wear on your thumbs. It reduces the effort needed to loosen tight muscles by giving no-thumb alternatives for Swedish massage techniques. The Thumbby™ sticks to walls (if they are smooth). You'll want one for reaching points on your back. You can use Thumbby™ hot, cold, or room temperature. You heat them the same as hot stones. They come out slightly cooler than stones and stay hot two to three times longer. You can also heat them in a towel cabinet or in the sun. DO NOT microwave! The Thumbby™ is light in weight and totally portable. Take a Thumbby™ with you when you travel to help stay loose on your journey. The FOOTLOG - RAINBOW is a scientifically designed foot massager and exerciser. Sit down, relax, and roll the FOOTLOG - RAINBOW back and forth under your feet. Try it both barefoot and with stockings; you will notice different sensations. Do this for 5 to 8 minutes. Roll the FOOTLOG - RAINBOW from the heel to the toe. Don't go too fast. Then do the sides of the feet, the arches, heels and toes for 3 or 4 more minutes. The BODYLOG 18" - RAINBOW was designed for both the professional and amateur athlete to massage muscles before or after strenuous exercise (running, cycling, swimming, weight lifting, aerobic, work, etc.). It has over 200 quarter-inch flexible “fingers” designed to penetrate the nerve endings associated with tightness or soreness of muscles. The BODYLOG 18" - RAINBOW is perfect for traveling, and it fits in a duffel bag so you can take it to the gym. It is 18" long with 4 1/2" handles on each side and a 7 1/2" massage area. Sprayology is a unique and innovative line of all natural homeopathic, pain relieving and vitamin oral sprays. Founded by D. Gary Young in 1993, Young Living Essential Oils is world renowned for exceptionally high-quality essential oils, dietary supplements, personal care products, and other unique solutions for healthy lifestyles. This letter explains the three different types of memberships and how you can order Young Living products at wholesale prices. 110 Uses For The "Everyday Oils Kit"
A practical guide for everyday use of Lavender, Peppermint, Frankincense, Peace & Calming, Purification, Panaway, Valor, Thieves and Lemon. Visit Mesothelioma.com to learn more on how mesothelioma patients are using massage as a palliative therapy in cancer treatment. These alternative therapy treatments are being used by individuals affected with the various forms of mesothelioma, such as Pleural Mesothelioma.